Albarino wine has become increasingly famous since the mid 1980s, however the grape variety has been planted for much longer than that. Ubiquitous to Galicia (in Spain) and Portugal, it’s still arguably underrated and well worth trying if you’ve never tasted it. Albarino is a white grape variety that grows both in the region of Galicia in Spain, as well as in Portugal. You’ll see both Albarino and Alvarinho on labels, depending on where the wine is from. In Portugal, it is called Alvarihno, and in Spain Albarino. Outside these two regions, Albariño is grown in other Spanish wine regions, and you’ll also find some plantings in California, Argentina and New Zealand. However it is really in Spain and Portugal that the overwhelming majority of Albariño wine comes from. Funny story though: for years, Australian winemakers had been producing what they thought was Albarino wine. But in 2008, a French expert questioned the origin of the grapes, and DNA test revealed that the grapes were in fact Savagnin!! WHAT DOES ALBARINO WINE TASTE LIKE? If you remember two things, it’s that Albarino is both aromatic and has a high acidity. The best varietal wines combine aromas and flavours that are both fruity and floral. So expect aromas of orange and acacia blossom all the way through to lemongrass and honeysuckle. In terms of fruity aromas, you will also often get aromas of peach, apricot and nectarine. As these wines often grow close from the seaside, you will also find some saline aromas. That, combined with the zingy acidity make Albarino wine very refreshing, and a great “palate cleanser” (more on that in a second). Albariño’s fresh acidity makes it a fine contrast to foods that are rich, salty, oily, fatty, or mildly spicy. As mentioned, the salty note of these wines pair well with seafood. Think oysters, white crab or fresh prawns. The salty notes in the wine will pick up on the salty notes in the food, and the two will match beautifully. Another way to use Albariño, is as a “palate cleanser”. If you have a dish that has some richness (for example a chicken in creamy sauce), then this fresh, crisp wine will clear your mouth and cut through the richness. This can create really lovely culinary experiences. And one last interesting combination is Albariño with mild Asian dishes. 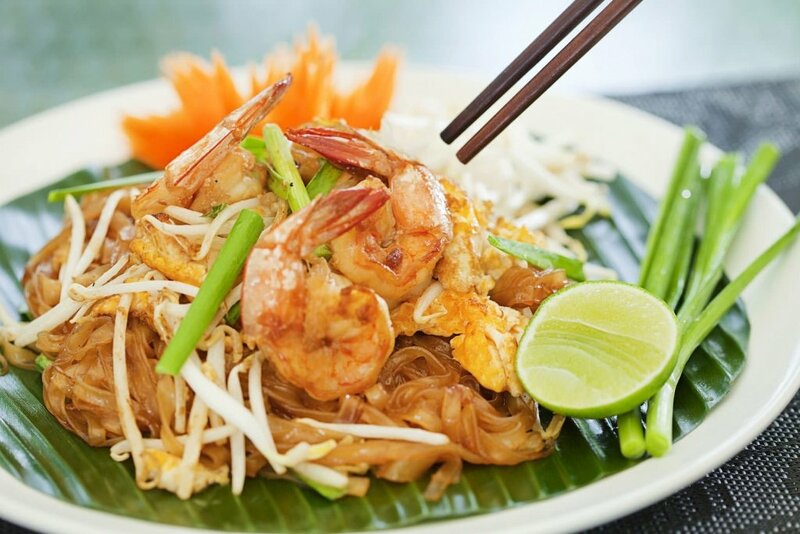 Go and get yourself a good Prawn Pad Thai for example, and pair that with a glass of Albariño – pure bliss! WHERE ARE THE BEST REGIONS FOR ALBARINO? 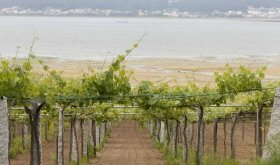 The best region for Albariño are still the two regions where the grape comes from: Galicia in Spain, and North West Portugal. 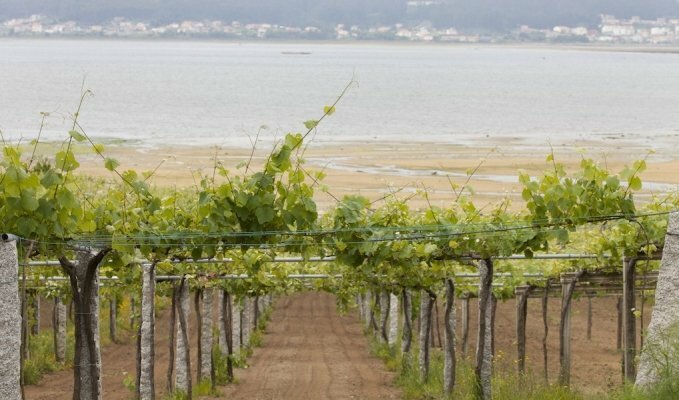 Specifically, the appellation of Rias Baixas in Galicia is home to many great wineries producing some excellent Albariño wines has hard granite soils combined with mineral-rich alluvial top soils which provide the perfect mix for this grape variety. In Portugal, seek out Albariño from the Vinho Verde region. There, you will find some real gems there too (see five to try below). As mentioned briefly in our first paragraph, Albariño is also grown outside of Spain and Portugal, but this represents a very small percentage of the worldwide production. If you’e looking to venture out into new Albariño territories, Uruguay, California and Argentina could be good places to start. As the Australians have discovered, Albariño is very similar in style to the well known Savagnin blanc grape variety of Jura region, France. I would also say that Albariño is comparable to varieties such as Dry Rieslings, or even Chenin Blanc. All three grapes can give this same hit of high acidity and highly aromatic profile which is so delightful.